108 degrees created a site that was appealing to the eye, unique to the brand and still neutral enough to handle the upcoming logo/brand redesign scheduled for January 2013. (Note that provided screens shots are from the original release site. The live site shows the new logo and colors updated in Jan/Feb 2013). The client response has been so well received, we are currently building a third site for another location managed by KeyPoint Partners. For our team, client satisfaction is paramount. When they ask for a second and third experience with our company, we feel confident that we are meeting their expectations and needs. Our development team chose the Zen theme b/c it is one of the most efficient for us to customize for the client's needs. The modules chosen are some of the standard ones used by our team to develop a unique brand appearance for the client, as well as provide the services and features needed for the project. 108 degrees provides online marketing solutions to small and mid-sized clients, including marketing planning and consulting services, social media marketing and website development, including the Drupal platform. The client sought a solution that would be both usable and scalable to the traffic levels expected. Drupal offered the ability to easily and affordably customize the site to their unique needs, while still providing a highly scalable solution that could handle the anticipated traffic growth in the years to come. 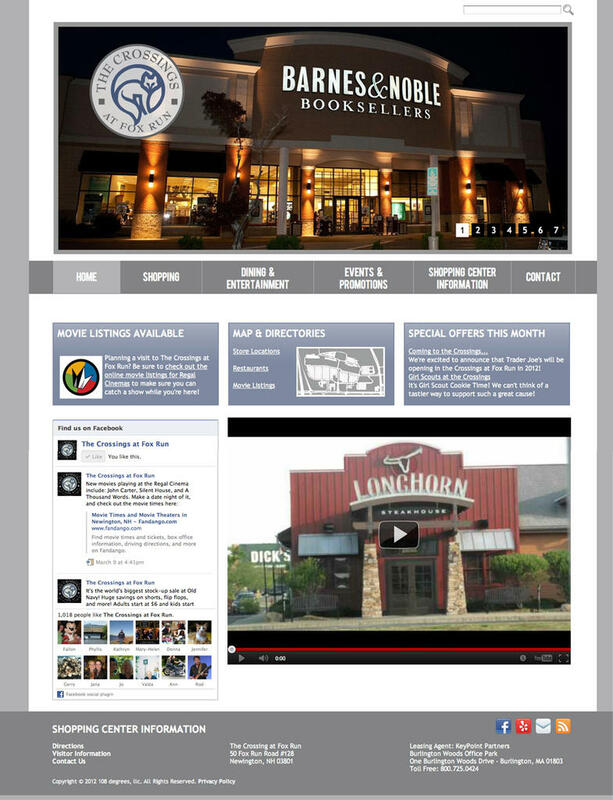 Most retail plaza websites in the region have a canned or non-unique appearance that does little to boost the brand of the location. 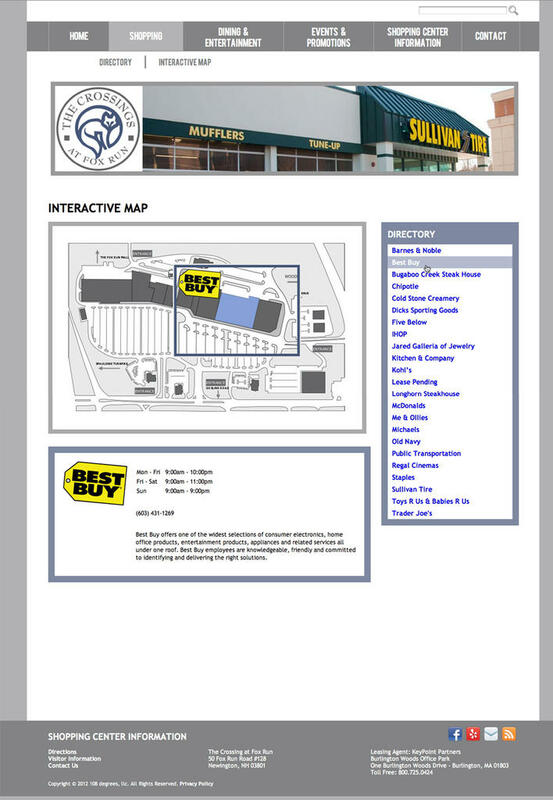 This client, located next door to a large indoor mall, needed a presentation that would be memorable to the site visitor and boost the brands of the retailers in the plaza. The Crossings at Fox Run is a 475,000 square foot power center located in Newington, NH next to the Fox Run Mall. The property management firm, KeyPoint Partners, selected 108 degrees to produce a website that would both promote the location to shoppers as well as provide leasing information to potential tenants. The shopping center includes over 20 stores and restaurants, featuring national box stores, as well as a stadium seating, 15-theatre cinema. as well as other standard features such as sitewide search, email marketing and social media integration, content management system and site performance analytics.